Longtime friends, collaborators and Grammy-winning musicians Erykah Badu and Robert Glasper have teamed up again for the track & video for "Maiysha (So Long)", from new album Everything's Beautiful--the visionary exploration of Miles Davis' music, featuring reimagined interpretations of his music produced by Glasper. The track's lyrics were written by Badu, and were based on "Maiysha" by Davis. 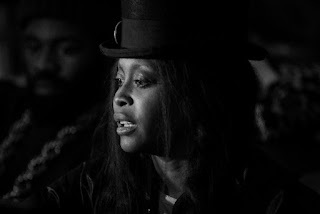 The video, entitled "So Long...That's What She Said," which Badu describes as having the feel of a short film, was conceptualized, written and directed by Badu. In keeping with the song's deceptively humorous lyrics, the "short" is a somewhat satirical wink at the musical performances from the classic variety shows of the '50s and '60s. The video stars a neurotic, beatnik chanteuse named Sarah Bellam--one of Badu's many personas--with Glasper as her tormented keyboard player and lover. The video also features a cameo by acclaimed harmonicist Frédéric Yonnet as the trumpet player performing Miles Davis' solo. The supporting musicians include Rashad "Ringo" Smith, drums, and Braylon Lacy, bass. Everything's Beautiful is out now and is part of Columbia/Legacy's commemoration of the globally renowned music innovator's 90(th) birthday. Released in late-May, the album debuted at #1 on Billboard's Jazz Album chart, and first week sales saw Davis charting the highest he ever has on the R&B Album Chart (#5), R&B/Hip Hop Album Chart (#10) and the Tastemaker Album Chart (#17). The album is a beautifully crafted collection produced by Glasper, blending a diverse group of master takes and outtakes from across the incomparable Miles Davis Columbia catalog with an impressive lineup of contemporary artists and musicians to create original interpretations. Some of the featured guest artists on Everything's Beautiful include Illa J, Erykah Badu, Bilal, Phonte, Hiatus Kaiyote, Laura Mvula, KING, Georgia Ann Muldrow, John Scofield, Ledisi, DJ Spinna and Stevie Wonder. Everything's Beautiful is unlike any other in Davis' discography. From the familiar (riffs and passages within the catalog) to the obscure (samples of Miles' in-studio instructions spoken after false starts), Glasper has built something unique but still unquestionably Miles. The album was executive produced with members of Davis' family--Erin Davis, Cheryl Davis and Vince Wilburn, Jr. from Miles Davis Properties, LLC. The cover art was created by Francine Turk and integrates elements of Miles Davis' artwork. With the cover, Turk creates a visual that is similar to the idea of Robert Glasper taking fragments of Miles music and reinterpreting in a unique and modern way. Everything's Beautiful is available now via iTunes (http://smarturl.it/Davis_Glasper_iTunes) and at the official Miles Davis store on milesdavis.com. Erykah Badu is a four-time GRAMMY award-winning singer, songwriter and producer who also describes herself as a "DJ, director, activist, holistic healer, doula, veggie, bgirl, observer, and hustler." Regarded as the Queen of Neo Soul, Badu's sound--a concoction of soul, hip-hop and jazz--cannot be confined to a single genre. She has released five universally acclaimed studio albums and one live album. Last November, Badu released her first collection of songs in five years with the mixtape But You Caint Use My Phone, which included her viral take on Drake's "Hotline Bling" as well as a collaboration with Andre 3000. This summer, Badu appears in The Land, a film that debuted at the 2016 Sundance Film Festival.